The Ylang Ylang Beach Resort, a family-owned Resort in Costa Rica, celebrates 29 years in business. The Ylang Ylang is known as one of the best resorts in Costa Rica. The Iocono family invites you to join them on the pristine white Costa Rican sands. The family-owned and operated Ylang Ylang Beach Resort and Spa is well-known as one of the best resorts in Costa Rica. Travellers from around the globe visit here to relax on the pristine, white beach front property in the midst of the jungle. The five star resort has all the comforts of home, unparalleled natural beauty, a restful Spa and a restaurant with incredible organic food. In addition, the Ylang Ylang is a sustainable property boasting a solar garden. Despite all this, the resort has humble beginnings. The founders of Ylang Ylang, Lenny and Patricia Iacono, acquired this beachfront property in the late 1970s and made a living selling dried fruit. They opened a health food restaurant, El Sano Banano in the center of Montezuma. Over time, the family developed the tropical beach front resort that was destined to be the Ylang Ylang. The Iaconos envisioned a stunning oasis for family, friends and partners to enjoy the natural beauty of Costa Rica. They more than succeeded in creating a secluded yet nurturing and relaxing environment. The hotel and bungalows opened in 1989. In early 2004, founders Lenny and Patricia changed the name to Ylang Ylang Beach Resort, after the aromatic Indonesian flower that dots the resort grounds. The Ylang Ylang restaurant was launched to keep the guests from having to leave the hotel and beach resort for their meals and establishing a more complete service. Lenny & Patricia’s home was transformed into this unique establishment … a shady, beach front palapa just yards from the ocean. Stone walkways part the lush tropical jungle to make way for guests. Patricia and Lenny started with only a grove of coconut and banana trees Their years of hard work, dedication and a deep passion for nature have left an incredible legacy for their next generation and for the many fans of this beautiful hotel and beach resort in Costa Rica. 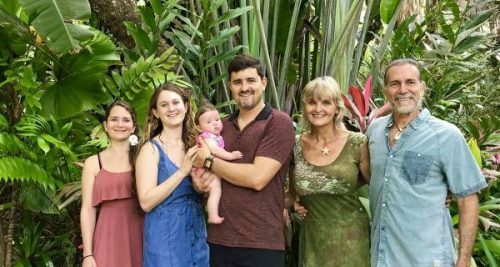 The founders are now retired, but they left the Ylang Ylang Beach Resort and El Sano Banano in the capable hands of their children and spouses, Moraya, Emma and Syska. This generation continues their parents vision of the best hotel and beach resort in Costa Rica. They nurture it with the same love for nature, health, wellness, relaxation and natural adventures as the founders did. The Ylang Ylang Beach Resort has been a family-owned and operated business for two generations. It’s considered one of the best resorts in Costa Rica. The resort opened in 2004 when the Iacono family renamed their pristine beach front property Ylang Ylang. The Iaconos have created a treasured, green sanctuary that’s visited by travelers from all over the globe.To learn more about this stunning, self-sustaining tropical beach front resort in Costa Rica, visit http://www.ylangylangbeachresort.com/.